The autumn may have been absurdly mild, with record breaking temperatures and weeks without rain, but as winter nibbles deeper into the tail of the year, so the saltwater anglers prepare for the arrival of cod. The Atlantic cod (Gadus morhua) has long been sought by Man. The white flesh makes for excellent eating, whether it be fried in batter or poached in milk. It also keeps well, and before the days of home freezing, fish would be salted and preserved for months on end. 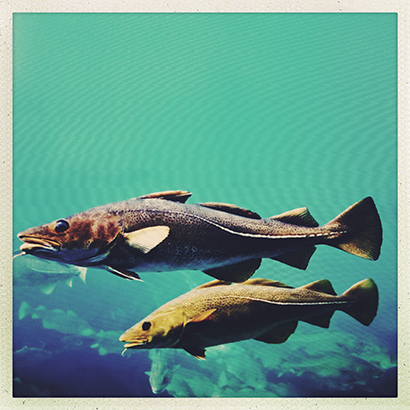 As is a sadly familiar story, the cod has suffered for its tastiness, and numbers have plummeted in recent decades. Overfishing has seen formerly rich water become barren, and though awareness has led to something of a recovery, stocks that were depleted by in excess of 95% will possibly never fully recover. Most anglers who fish for cod in the winter months do so with conservation in mind. Fish that would once have been routinely kept for the pot are now returned, and cod numbers in traditionally noted marks such as the Humber Estuary are creeping upwards. Bigger fish are returning to offshore wrecks too, where given the chance they will live long and grow huge – certainly well in excess of 100lbs. Fishpool would have a large portion of chips with one of them – but would forgo the pea fritter….